During Lucky Fabb I had the pleasure of munching on some delicious chocolates provided by Fannie May. They are ultra-premium, artisan jewel chocolates from chocolatier Norman Love. Luckily for me I didn’t have to fill up at Lucky Fabb, they gave us a box of our own to take home. I summoned all the will power I had to make sure I saved a few. I’m so happy to be able to provide one of you the opprotunity to try these for yourself. There are twelve hand-crafted decadent flavors and they retail for $29.99. FM Artisan by Norman Love includes a wide variety of diverse flavors to compliment the many colors of each handcrafted chocolate. Flavors stretch from Chocolate Dipped Strawberry, Bourbon Vanilla, and Candy Apple to Peanut Butter Fudge and Birthday Cake. 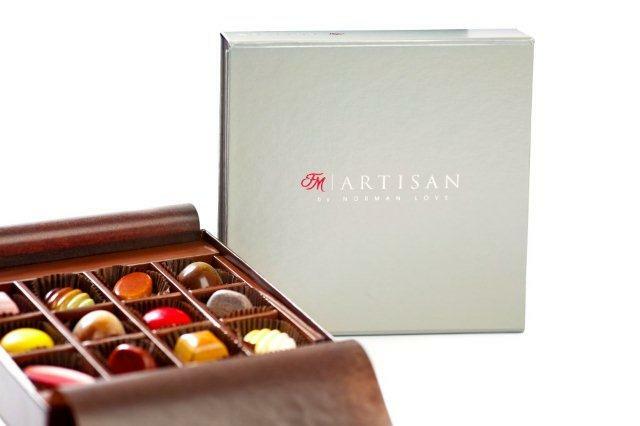 These vibrant taste spectrums of ultra-premium chocolates are also made without preservatives. The chocolates launch on October 15th, and for those of you not lucky enough to win a box of your own. Use promo code 18457 to save 25% off (valid 10/15- 10/22). Check out the Fannie May Facebook page to learn more.